After years of watching a once thriving middle-class bedroom community crumble under the weight of population loss; an ever shrinking tax base and a hobbled business district, a group of Wilkinsburg residents came together in 2004 to talk about how they could stave the ongoing decline of their neighborhoods and community. Located about nine miles east of downtown Pittsburgh, Wilkinsburg, which also borders the municipalities of Penn Hills, Churchill, Forest Hills, Edgewood, and Braddock Hills, is one of the oldest boroughs in Allegheny County and it stretches over some 2.1 square miles. Like many of the Mon Valley communities that were devastated by the collapse of the region’s once booming steel industry, Wilkinsburg suffered over the years under the yoke of economic decline that saw “urban flight” lead to skyrocketing property taxes, dilapidated and abandoned houses, crime, and vacant housing lots. And so borough residents, civic leaders, and other stakeholders started the conversation with the premise that if they could refurbish some of the rundown properties in their neighborhoods and put to use the overgrown vacant lots, they could begin to improve the appearance of their community, which would in turn spur renewed interest and economic activity in the borough. It was during that community visioning process that PHLF was invited to help chart a path forward. 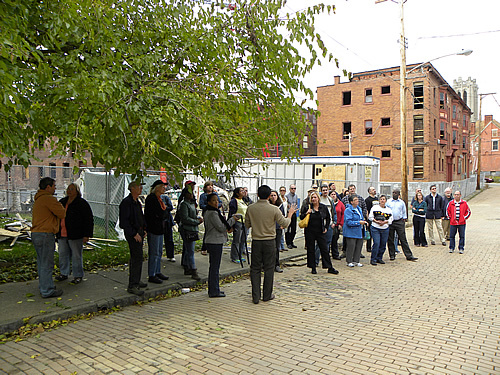 Our work started in 2004 when we commissioned and published the Wilkinsburg Neighborhood Transformation Initiative, a document the unified the residents around the concept of using historic preservation to create economic, social, and cultural renewal. Working with Community Technical Assistance Center in 2005, PHLF completed a survey of 1,200 land parcels in the borough, which showed that 70 percent of the housing structures could be historically restored. 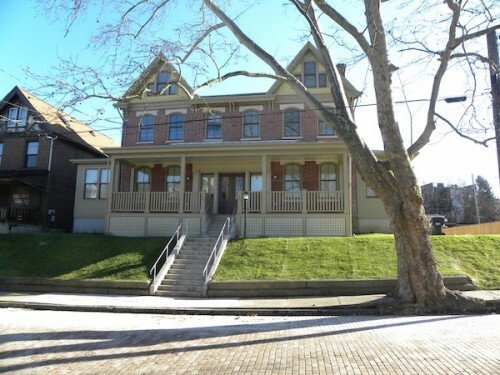 We went to work in the Hamnett Place neighborhood—now listed on the National Register of Historic Places—starting with the full historic restoration of four single-family houses on Jeanette and Holland Streets with funding from PHLF, the Sarah Scaife Foundation and the Allegheny County Department of Economic Development. Restoration was completed in 2008 and the houses were immediately purchased and occupied by new owners and residents in the neighborhood. 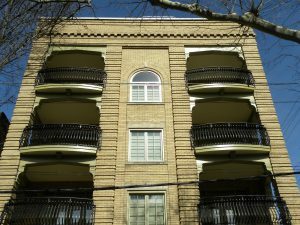 It was a momentous turning point for Hamnett Place because a market was verified for quality, historically restored housing, in a neighborhood and a borough that had been relegated for too long to the malaise of dilapidated, vacant, and blighted properties. 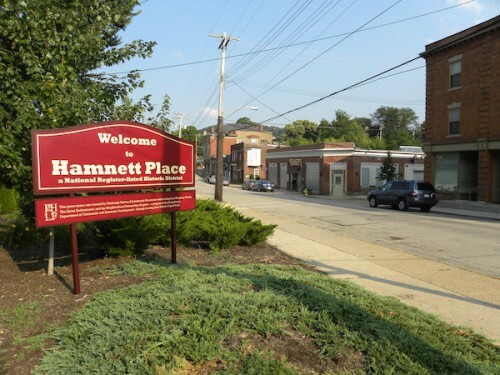 With the successful completion of the first phase of house restorations, PHLF leveraged its decades-long experience in neighborhood stabilization and restoration by interweaving numerous programs and initiatives, in addition to different types of funding sources, which are working together to bring multiple community revitalization programs to Hamnett Place and the Borough of Wilkinsburg. In 2009, Landmarks Community Capital Corporation, a nonprofit subsidiary of PHLF, and a newly formed Wilkinsburg Community Development Corporation (WCDC), jointly applied and were approved for a Neighborhood Partnership Program (NPP), a state-tax credit program that incentivizes business to invest in communities. The Wilkinsburg NPP, jointly shared between PHLF and WCDC, was launched with a six-year funding commitment from TriState Capital Bank. In 2010, PHLF completed the restoration of a former auto repair shop, located at 744 Rebecca Avenue, in the Hamnett Place neighborhood, converting it into a state-of-the-art educational facility known as the Landmarks Preservation Resource Center. The center highlights the principles of our work through workshops, seminars, lectures and film screenings on all aspects of historic preservation to include: do-it-yourself instruction on house restoration; lectures on architectural history; energy efficiency and green building techniques; house financing for first time house buyers and other public policy and community development topics. 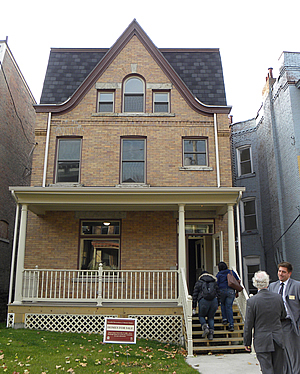 In 2010, we embarked on a second phase of restoration in Hamnett Place, which included three single-family houses on Holland and Jeanette Streets through funding from the Allegheny Foundation, a Richard M. Scaife charitable foundation, and the Allegheny County Department of Economic Development. We completed the second phase of single-family house restorations in 2012 and sold the houses to three new property owners and residents in Hamnett Place neighborhood, further validating the market. Concurrent with the second phase of house restorations, we also undertook the restoration of two historic apartment buildings, the Crescent, a 1904 uniquely shaped building that had almost collapsed due to weather deterioration and abandonment and the Wilson apartment building, once a great house, converted into apartments, and also decaying under the blight of abandonment. Both buildings were masterfully restored to include a total of 27 renovated units—23 in the Crescent located at 738 Rebecca Avenue and 4 in the Wilson, located at 506-08 Jeanette Street—with funding provided in part by the Pennsylvania Housing Finance Agency, Allegheny County Departments of Economic Development and Supportive Services, Federal Home Loan Bank of Pittsburgh, and PNC Bank. As part of our comprehensive restoration initiative in Hamnett Place, PHLF acquired two vacant lots, which have since been cleaned up and landscaped to include a vegetable community garden and green space, and a flower garden at the Rebecca Avenue entrance into the neighborhood. Thanks to funding from the Heinz Endowments, Allegheny County, and a grant from a PHLF donor, we were able to help community members organize around the concept of a community garden and green space. Ronald Butler, a Pittsburgh Public School student worked with Hamnett Place residents to design “Piano Place,” a green space in the shape of a Piano with benches and play installations to complement a 20-bed vegetable garden on a 19,000 square-foot lot now known as the Hamnett Place Community Garden and Piano Place. In 2014, Landmarks Development Corporation, a PHLF-subsidiary was awarded federal historic rehabilitation tax credits and low-income housing through the Pennsylvania Housing Finance Agency (PHFA), for the Falconhurst Neighborhood Restoration Development Program, a multi-site project that will create 33 more affordable housing units and newly constructed buildings in the Hamnett Place neighborhood. This phase will include the full restoration of the Falconhurst apartment building at 724 Kelly Avenue, adjacent to the restored Crescent Apartments, which has been vacant for more than 15 years. The building will be renovated along with properties at 520 Jeanette Street, 855 Rebecca Avenue, and 606 Mulberry Street. Two new townhouses will be constructed on a lot at 604 and 606 Mulberry Street. 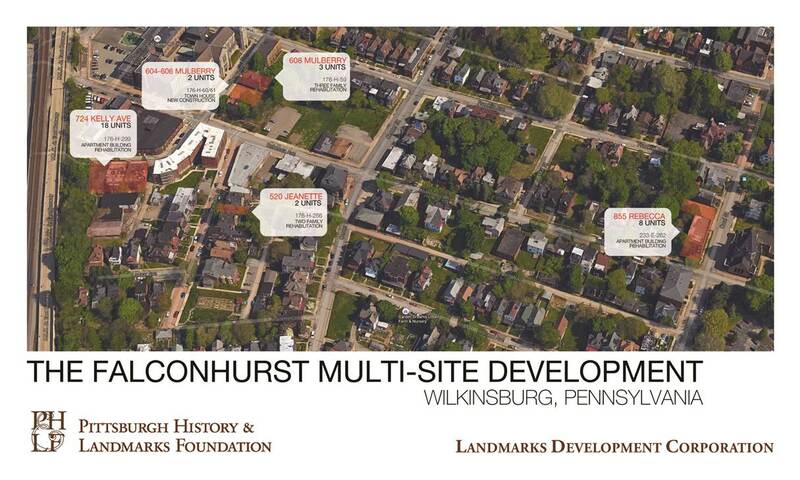 With this new development, PHLF’s total investment in Wilkinsburg will exceed $25 million and construction on this phase is expected to begin in fall 2015 and last for 15 months. LDA Architects is the project architect and Sota Construction Services will be the general contractor. 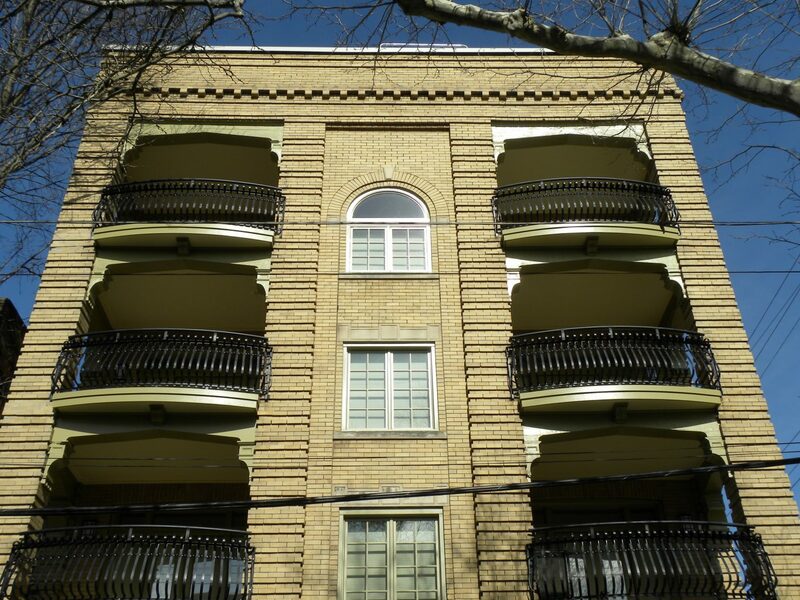 The restored Falconhurst Apartments building, located at 724 Kelly Avenue was completed in December 2016 and is the second massive apartment building to be restored next to the Crescent. 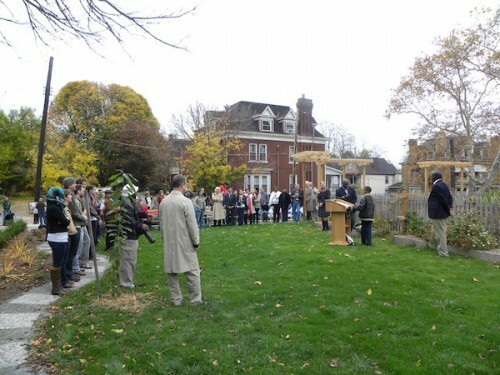 In November 2016, Allegheny County Executive Rich Fitzgerald along with the residents, Wilkinsburg borough officials, and other community and civic leaders joined us to announce the completion of the Falconhurst Development, an $11.5 million historic restoration and affordable housing initiative. 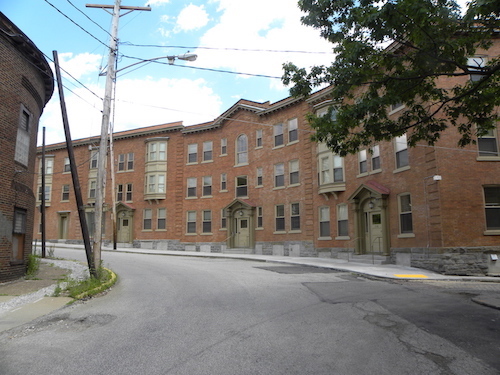 This building at 855 Rebecca Avenue, the Columbia Apartments in Wilkinsburg created 8 units of restored quality affordable housing units. 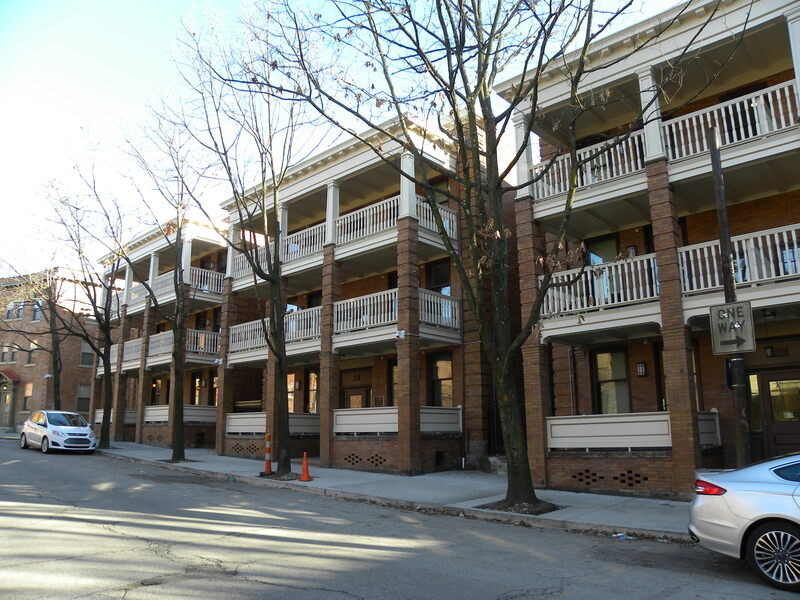 With this restoration, PHLF and its subsidiaries have restored blocks of housing along Kelly Avenue and Mulberry Street, in addition to significant portions of Rebecca Avenue and Jeanette Street, in a neighborhood where PHLF and its subsidiaries have been active in restoring single family homes, apartment buildings, and beautifying blighted and vacant lots. This work would not be possible without various partners and investors including the Pennsylvania Department of Community and Economic Development, the Pennsylvania Housing Finance Agency, the Pennsylvania Historical and Museum Commission, Allegheny County, and PNC Bank among others. 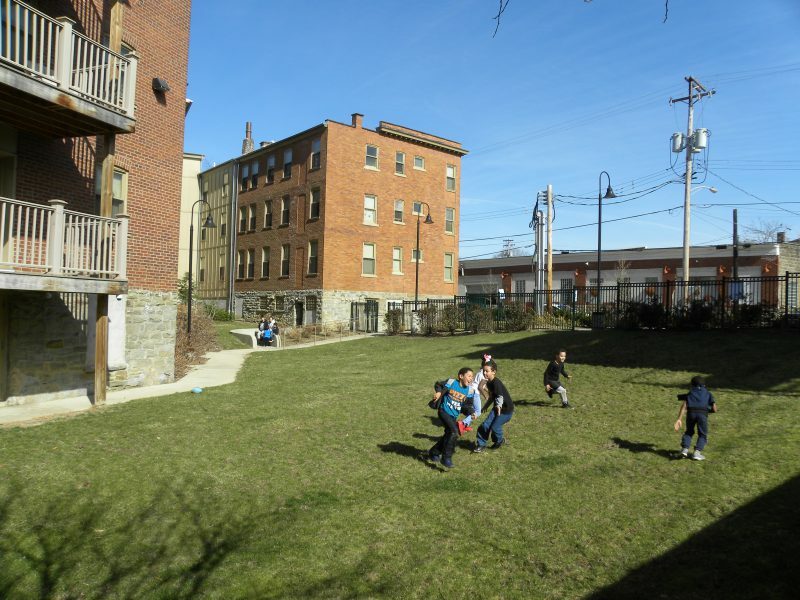 Kids playing on the lawn behind the restored Crescent Apartment building in Wilkinsburg represent the sense of place and community that has been enhanced by the historic preservation and restoration of this neighborhood.